Located in the heart of modern-day New England stand sites of such great antiquity; sites so enigmatic, so sophisticated and seemingly inexplicable, serious scientists and archaeologists have denied their study because of their monumental implications: it would force them to throw away their preconceived notions about the achievements of ancient man into the historical garbage can. Mystery Hill, the Upton Cave, Calendar I and Calendar II, Gungywamp and Druid’s Hill are just several of the names given some incredibly important historical sites of which many have never heard a whisper. But their existence—and their importance—is becoming harder and harder to hide as more are discovered and interested folk become exposed to their grandeur. Sometime in the late 1600s or early 1700s, early American colonists began discovering and utilizing underground “root cellars” made of large but manageable pieces of dressed stone as storage houses for food stuffs. Colonists were also finding numerous stone buildings, usually of “one story, circular or rectangular in form, and up to 30 feet in length and up to 10 feet wide and eight feet high or more.” Many included roof slabs or lintels of several tons. Many also had carefully crafted openings in their roofs which allowed a small amount of light to pass through to the interiors. The colonial newcomers were convinced that these so-called root cellars had been constructed by the former Amerind inhabitants of the area—irrespective of the fact that their Indian neighbors showed little hint of an ability to work in large stone or the desire to do so. Before long, the inheritors of these properties thought their own American ancestors had built these cellars—some which were eighty feet deep and lined the entire way with roughly hewn stone. Simultaneously, hundreds, perhaps thousands, of oddly-inscribed flagstones were being found in the surrounding New England woods, carted off by farmers for use in stone walls or in larger stone structures in the settlements of the growing northeast. The angular cuts on these stones looked much like the marks a plow makes when it strikes a submerged piece of stone—at least they looked that way to most of the simple country farmers of the day. Others believed the markings appearing in rocks all across New England were “the action of the roots of trees.” For decades nothing at all was thought of them. As any New Englander can tell you, the entire northeast is strewn with large chunks of striated stone material left from the last era of glacial recession. But a local Puritan clergyman, Cotton Mather, was not convinced. In 1712 he discovered some strange incisions on an exposed seaside rockface in Dighton, Massachusetts—far from where any plow could have marked it. 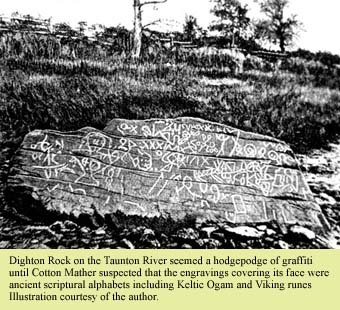 He immediately wrote to the Royal Society in London, England, to inform them of his find and to convey his belief that the rock carvings were in fact an ancient scriptural alphabet—perhaps several differing ancient alphabets. Unexpectedly, his letter generated little interest. The scientists of the Royal Society were already busy exploring newly discovered rock inscriptions in neighboring Ireland. These European inscriptions were later identified as Irish Hinge Ogam, a form of Gaelic Keltic writing unknown for centuries and stubbornly undecipherable. It is referred to as “hinge” Ogam because a central dividing line or a facet edge was used to separate the subtly different individual characters. Little did anyone know at the time, the inscriptions found on both sides of the Atlantic were firmly connected. Yet how could Celtic writing, a style reminiscent of that from the first millennium B.C., be in America? Who were the authors of the many rock engravings? How could the carvers possibly have gotten to America a thousand years before the birth of Christ? Why had they come and what evidence is there to support such a far-fetched notion? And what of the large stone structures found across the American northeast, eerily similar to types found in Europe? The answers were being spoken loudly and clearly if someone could only listen to what the rocks and buildings themselves had to say. But time seemed to be running out. Thousands of the inscribed rocks were being broken up for building material and the larger stone structures were being dismantled or vandalized, destroying the monumental works of these mysterious builders. One summer day, I drove to the top of a mountain in central Vermont. At the top, I parked and started walking around. I get a certain feeling at power centers and I was picking up on this feeling as I found a standing stone and a recumbent stone with Iberian Ogam inscriptions believed to have been written by European Celts 3000 years ago. So much for Columbus “discovering” America. At the center of this cosmic place is a beautifully preserved underground chamber called Calendar II because it is oriented to the midwinter sunrise. If you sit inside the chamber and look out the entranceway on the morning of the winter solstice, December 21, the sun will rise in the center of the entrance. Analysis by archeoastronomer Byron Dix shows that the chamber was also used in lunar observations and eclipse prediction. This is only one of many such sites found all over New England. This chamber, like most other such chambers, is located over an underground water spring and a ley-line power center. As I entered the chamber, I felt a palpable presence in the air, an increase in energy density, an intensity of experience. It came to me that this chamber was specially designed to evoke these kinds of feelings and experiences. The overhead lintel stones weigh approximately three tons each. I couldn’t stay in the chamber for more than five minutes. The “volume” of the energy in this place was too high for my tastes and sensitivity. Monuments harbor the potential for universal creative power that can be directed for the progress of humanity. In India, such spots are called tantrapieds, places for liberation and enlightenment. These sacred places have a very spiritual vibration, facilitating deep meditation and contemplation. Over the years the more interesting features and structures on-site have been given un-scientific names that insinuate inferred function. The “Watch House” is the name given to a chamber structure located outside the main complex at Mystery Hill. The roof is a massive, quarried slab of granite of several tons. On the back wall of the chamber the stones contain a high percentage of white quartz, a stone found in its pure form in many of the neolithic structures over the world and treasured by ancient peoples for its reflective qualities. This particular chamber is aligned to the February first sunrise and lunar minor south. At sunrise on this date the sunlight enters the entrance of the chamber and slowly moves along one wall until it illuminates the quartz crystals at the back wall, making the semi-precious gems sparkle noticeably. February first was one of the eight most important divisions of the Keltic year as we shall discuss in more detail later. The “Oracle Chamber” is one of the most interesting and important structures located at Mystery Hill—or anywhere for that matter. It is significantly larger than any other chamber found at the site and contains unique characteristics found nowhere else in any of the other megalithic sites in New England. A 4 inch by 6 inch shaft, lined with thin facing stones, runs from the exterior and enters through the interior wall at about chin level. The “Speaking Tube,” as it is called, emerges above ground, yet concealed underneath a sacrificial altar with runnels. It would seem that the speakers within the Oracle Chamber could talk into the tube, their voices warped and amplified, carrying up to the altar above and creating quite an impressive sound to a group of worshippers who might be gathered around the altar—in effect making the altar talk. Also found across the Mystery Hill site are huge monolithic standing stones (some now fallen) all of which line up to sun, moon or star alignments as seen from a central viewing slab located by one of the earlier researchers at the site. From this slab, monoliths align to the Midwinter solstice sunrise and sunset, the November one sunrise and sunset, the Spring and Fall Equinox sunrises and sunsets, the May one sunrise and sunset, the Midsummer solstice sunrise and sunset, the August one sunrise and sunset and true north (this stone is aligned to the star Thuban, the pole star of 2,000 B.C.). On these days the sun will either rise or set above worked monolith stones. Exact alignments coincide, according to scholars and astronomers, with a date of 2499 B.C. to 1900 B.C. Other impressive constructions on the site include a number of underground chambers with clear astronomical alignments. 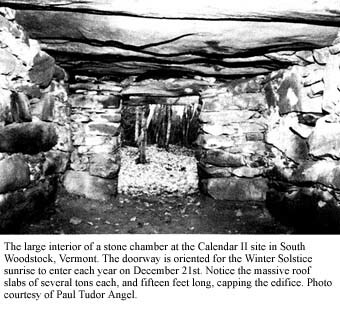 The calendrical orientations of these slab-roofed chambers, it would seem, would rule out these structures being constructed as root cellars by early American colonists or the woodlands Indians of the northeast as neither were concerned with alignments that coincide with the most important of yearly Keltic celebrations. Further, noted archaeo-astronomer Byron Dix has determined that New England is replete with underground chambers. He says, “ there are some 105 astronomically aligned chambers in Massachusetts, 51 in New Hampshire, 41 in Vermont, 62 in Connecticut, 12 in Rhode Island, and 4 in Maine.”1 Suffice it to say, it is obvious that the alignments found at Mystery Hill and other sites are not random. It too bears a striking resemblance to altar stones found at megalithic sites in Europe. 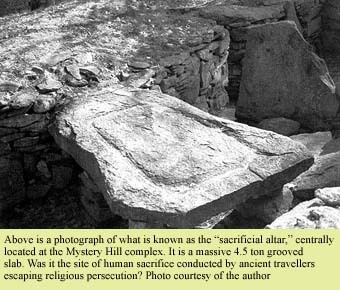 And we do know that blood sacrifice and altars such as these were connected firmly to Neolithic religions. But even more than mere physical resemblance to European sites, it was carbon dating, carried out under the supervision of respected scientists from Geochron Laboratories in 1971 that supported the disputed claims of researchers who were being ridiculed for insisting that Mystery Hill was a site of extreme antiquity. Carbon tests conducted on charcoal found alongside a stone pick and a hammer stone unearthed at an excavation near one of the underground chambers reveal a date of 2,000 B.C. The artifacts were clearly related to Neolithic pieces of the same era in the British Isles and Iberia. The excavation pit carbon tested had been undisturbed before digging and layers of strata above were perfectly intact. Unfortunately, many of the other structures at the site were carted away, vandalized or destroyed—yet what remains should be viewed as one of the most important historical sites in the Western Hemisphere. And Mystery Hill is not—by far—the only megalithic site in New England whose origins are somewhat clouded. The dolmen usually was erected to commemorate the death of a chieftain or an historical event of great importance and scriptural incisions usually accompany the dolmen on stone markers. Some experts believe that the dolmen was actually a tomb that was then covered in huge amounts of earth—in effect a tumulous tomb in which the earth has been eroded away. Dolmens are frequently occurring structures in the American northeast. 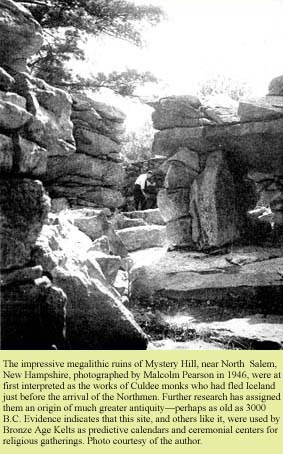 There are in fact over 200 examples of dolmens in New England alone and some very impressive examples can be found in our country as far away as California. Another frequently occurring megalithic structure familiar to all readers is the stone circle. We know of the great Stonehenge complex in England with its huge stones found there and the many calendrical alignments they delineate. But there are ancient stone circles in New England as well. Probably the most intriguing archaeological site in Connecticut is located in Groton and is called “Gungywamp,” thought to be an ancient Indian name, but actually ancient Gaelic meaning, “Church of the People.” Besides containing beehive chambers and petroglyphs, the Gungywamp site has a double circle of stones near its center, just north of two stone chambers. Two concentric circles of large quarried stones large slabs laid end to end—are at the center of the site. Extensive fire burning on some of the slabs is apparent which leads many to believe it was an ancient altar. Nearby there are several large pillar stones and one boulder slab that have been carefully positioned along astronomical site lines. This oval mound was measured at 112 feet long by 56 feet wide. And the stones, as Whittall predicted, provided astronomical alignments. The monoliths were oriented east to west, and bearings of the sight indicated that it had been used to observe solar events. The first observation was made on September 22nd, the fall equinox, from the highest stone on the western side from the peak of the eastern most stone. The sun set behind stone number four just as Whittall had surmised. This article was originally published in The Barnes Review and is reprinted here in edited form with the kind permission of the author. The mission of The Barnes Review is “...To Bring History Into Accord With The Facts, in the tradition of the Father of Historical Revisionism, Dr. Harry Elmer Barnes.” For more information about The Barnes Review, write: 130 3rd. Street, S.E., Washington, D.C. 20003; call toll-free: 877-773-9077; or visit www.barnesreview.org. 1. Barry Fell, America, B.C.—Ancient Settlers In the New World. (New York: Simon and Schuster, 1989), p. 215. 2. Joanne Dondero Lambert, America’s Stonehenge—An Interpretive Guide. Kingston, New Hampshire, Sunrise Publications, 1996), p. 45. 3. Robert Ellis Cahill, New England’s Ancient Mysteries. (Salem, Massachusetts: Old Saltbox Publishing House, 1993), p. 41. This is a subject that I have a great fascination with. I will, in this post, refer the readers to several websites that deal with the issue of the mysterious lithic structures that dot the woodlands of New England that have been neither attributed to the Amerindians that once dwelt here or to European colonists in the 17th, 18th and early 19th centuries. I myself have visited a few but getting good directions to many of the sites is difficult as those who know are frugal with their words for fear of vandalism and other such nasty things. Most sites are on private property but some such as "America's Stonehenge" and Gungywamp are open for business. Last edited by Allenson; Monday, August 16th, 2004 at 08:44 PM. How fascinating! Being a perpetual West-Coaster, I have never heard of such stone structures in New England...My interest on the subject has been sufficiently perked. Thanks for the info (and links). Very interesting...I lived in New England for around 6 years and I never heard of such a thing. Thanks for the links. Did you see our discussion of this in the German vs. Roman thread (I think that was it)? The megaliths are too old to be remnants of Celtic, Germanic, etc. cultures that might have made it to New England. I think they were built by pre-IE Atlantids (basically Pict or Basque types) as much as 4,000 years ago. Thanks for posting these links, this is very interesting! I did see that discussion and interestingly enough, I'd been thinking about getting a thread going about these structures and you spurred me on, Stribog. Anyway, I'm not surprised to hear that folks, even those who have lived in NE, haven't heard of this mystery as they are ill-studied and have received little 'press' over the years. Finding good research on them not conducted by 'New Agers' is almost as difficult as finding the structures themselves in the New England woodlands. I'm sort of getting the ball rolling here as I haven't read too much about them yet--but I've recently located some older scholarly work done on them that I plan to read over the next few weeks. I will post intersting tid-bits as I glean them from the studies. My interest and motiviation is unashmedly to reckon, at least in my own mind, whether or not Europids came here to the New World at a much earlier date that the coventional wisdom holds. I'm not trying to lay claim to the continent and take it from the Amerindians--just to fight the PC dogma a little. I've scanned some distriubution maps from a book entitled The Search for Lost America--The Mysteries of the Stone Ruins by Salvatore Michael Trento. The maps are of the distribution of 'stone piles' or cairns, perched rocks and standing stones, and lastly, the slab-roofed chambers. The maps were scanned at 300 DPI so if you save them to your machine and then zoom in with Photoshop or something similar, they should be of the finest-kind. I will post more on the subject soon. Last edited by Allenson; Monday, August 16th, 2004 at 08:33 PM.